Every parent wants their newborn child to be happy and comfortable. And one of the important things for any newborn to have is a good crib where it can play easily and sleep comfortably. Interestingly, what you do need to realize is that you need a crib that isn’t just comfortable but is portable as well. This is because you would need to carry the crib around with you no matter where you go, and it’s always a good idea to get one that does the job well. You need the Best Pack and Play for you. And this is where you would need a good pack and play with you for your baby. When new parents think of the words ‘pack and play’ most of them think that it means packing up the product and moving from one place to another with their little one. 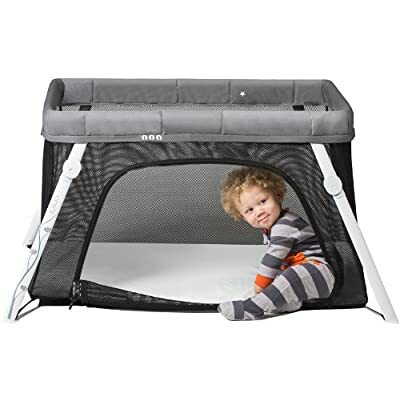 This however is not completely true as for the first few months of your infant’s life, he will not be moving around much outside the house and this product will actually be used as a good sleeping spot for the newborn without the parents having to worry about him at all times. 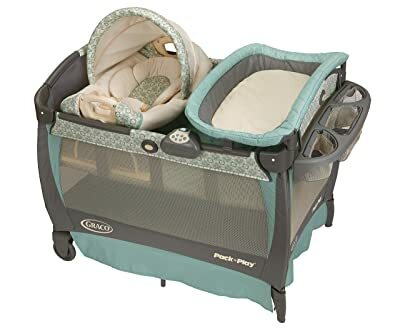 A regular crib is not suited for newborn and small infants and a pack and play proves to be a safe and enjoyable place for the newborns to rest in close to his parents and under their supervision. In order to make your job easy, we have reviewed 10 of the best pack and play available in the market. Any of these products are great for your newborn and will help them enjoy both sleep and playtime. This amazing Pack and Play from Lotus is great for travelling and is highly portable. It takes just 15 seconds to be set-up completely and comes with backpack portability. You can fit it as a carry-on and use it simply anywhere and everywhere you go. Being Greenguard Gold certified, this product is absolutely safe by all means. ​Weighing just 13 lbs, it is extremely lightweight and also beautiful to look at. The graphics and logos are quite artistic while the soft fabrics and soothing colors allow the little one to feel comfortable all day long. Moreover, the crib cover can be removed and wash in the machine. Another great product from Graco, this too is a favorite amongst new parents. 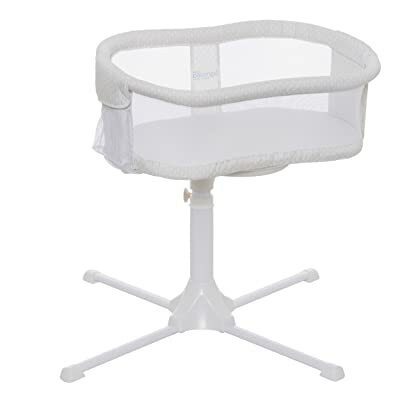 An unique feature in this pack and play is that the bassinet which fill-sized and removable, is designed in a manner that it too folds along with the playard so that parents can quickly set it up and take it down as need be. It is extremely easy to store and carry places as the folding feet and wheels offer 20 percent more compact folds than most other playards. Graco’s signature push-button fold feature makes the closing hassle-free. A durable frame ensures full safety of the little one when inside the playard making it an ideal choice for travelling to a new place. Fisher-Price has come up with this innovative padded play yard which also functions as a changing station and an inclined sleeper making it easy for new parents to handle their little ones and perform all basic tasks in one place! The inclined sleeper is removable and comes with a head support along with a machine-washable pad. The changing station diaper clutch is portable and comes with built-in wipes container. It weighs on 15 lbs which is almost half the weight of other similar playards making it highly portable and favorable to carry to different places. The playard is pretty spacious allowing the little one to rest, sleep and play at the same place all day long. 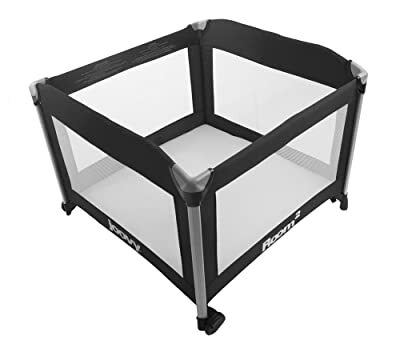 The pack and play is quite easy to assemble and fold with no loose pieces. When you are travelling with it, all you need to do is put everything inside the travel bag provided with the playard which can be slung on the shoulder and move! Another great product, it is made from 600D material for extreme durability and comes with wheels so that the playard can be easily moved from one place to another. Joovy has ensured that parents can easily and quickly fold this playard and also set it up as need be. A deluxe carry bag with shoulder strap makes commuting easy. The fitted mattress sheets in this playard are made of 100 percent cotton and offer ample space to the little one to play in with 10 square inches of floor area. The huge mesh windows offer good visibility of the baby when inside the playard and also allow air flow in and out easily. Also, the little one can easily play and sleep in this playard for hours without feeling lonely or bored. Being made of super strong steel frame this playard comes with aluminum tubing which make the product look clean and elegant. This is a colourful and attractive playard from Graco which is sure to please newborns and infants immediately. With a 38 x 38 inch square play space, this playard is quite roomy and large and creates a safe play area for the baby. It can be easily cleaned and maintained without hassles. Parents can use this playard everywhere and anywhere they want as it sets up and folds within 60 seconds. Moreover, a carrying bag allows no-fuss storage and travel and is pretty convenient to use. The durable frame is quite lightweight and weighs around 25 pounds. 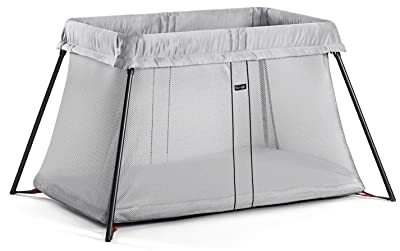 The infant inside the playard gets ample ventilation through the airy mesh provided on all sides and parents too can keep a check on the little one through this mesh. Beautiful artistic graphics adorn this mesh. This product is recommended for children who are up to 35 inches tall and cannot climb out of the playard. This is a pack and play made fully from polyester and boasts of a simple yet elegant design. 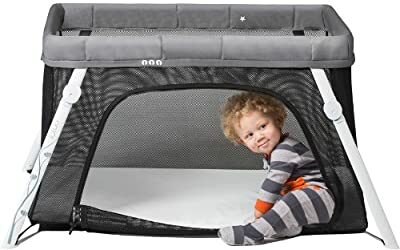 The sides of this playard boast of an airy and soft mesh which allows the little one to breathe easily while the new parents can keep an eye on their little one and see what he is up to when inside the playard. 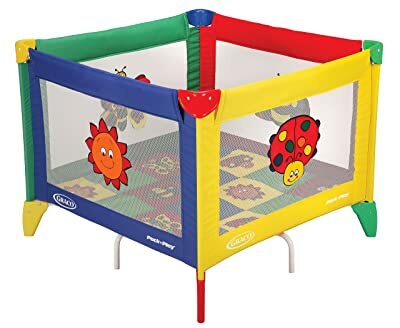 The playard takes just a few seconds to be set up or folded and can be easily carried to a friend’s house or even on the plane while travelling. The mattress is made of extremely soft fabrics which can be removed and washed in case they get dirty or soiled. Moreover, the waterproof mattress is insulated keeping the baby warm and comfortable especially during winters. Weighing just 11 pounds, it would not be easy to find a playard as lightweight as this one. The playard is available in a beautiful silver color which matches with any kind of existing decor. 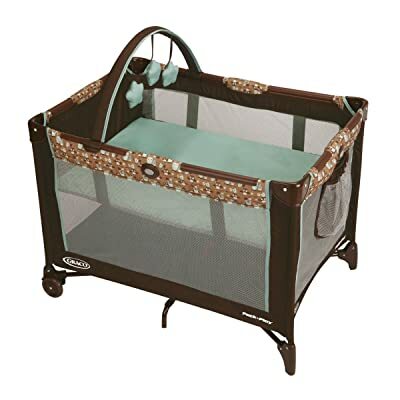 This product from Graco has been completely made in USA and is a favorite amongst several parents around the nation. It has a unique feature of a vibrating rocking seat known as Cuddle Cove which allows the parent to carry the baby with them easily. Moreover, the handles offer a smooth grip every time the playard is taken from one place to another. Another reason why this is an ideal choice is that the product grows with the little one and helps him through the transition from the newborn phase in to the infant one and then toddler. The fabrics used in the rocking seat are made from soft and luxurious fabrics which are gentle on the newborn’s skin and let him relax in it all day long. This is a great product from HALO which allows the newborn to sleep right next to his parents in the same room and yet in his own space. It has a unique feature of rotating and swivelling a full 360 degrees so that parents can get their little one closer to them immediately and from any side. At night, mothers can tend to the baby if need be by lowering the sidewalls which can also be locked otherwise. It has a 4 point base which can adjust on most beds with the base tucking under the bed and thereby taking up very little space in any room. You will find a nightlight, 3 nature and womb sounds and lullabies and also 2 vibration levels with a nursing timer. The mesh walls allow the little one to be visible at eye level and make for an airy and comfortable room. This is a complete innovation in the world of playards where parents can purchase a reversible napper and changer in one product! 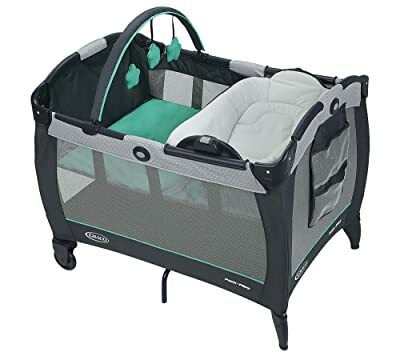 Graco has done it again with this amazing product where parents can make use of a safe attachment to switch between a playard with a napper or a changer. The playard has been so designed that it undergoes transition just as the newborn becomes an infant and then a toddler. The newborn napper station comes with beautiful and comfortable fabrics and a toy bar feature on top. The changer features mess-resistant and wipe clean fabrics which are so easy to maintain. The napper can be used for babies under 3 months of age who are unable to roll over while the changer is good for babies that are up to 15 lbs in weight. The airy mesh on all sides’ offers proper ventilation and the mother can keep a check on the baby while napping. 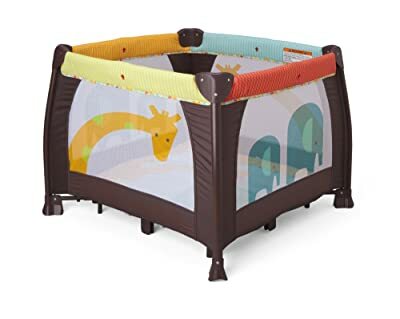 The last playard that we are going to review here is the Delta Children 36” x36” Playard which is a great product for children who cannot climb out of it and are less than 35 inches in height. The frame of the playard is exposed metal edges. The playard comes with a carrying bag so that parents can easily fold it and carry it with them when travelling or visiting a friend’s house or store it when not in use. The mattress also comes included in the pack which is quite spacious and comfortable to lie in and play on. The product weighs around 28 pounds and needs to be assembled at home after delivery. It meets all the ASTM and CPSC Standards and has been certified by JPMA. The graphic artwork on all the 4 sides of the airy mesh appeal to little infants and give a clear view of the baby at all times. Do consider the fact as to how much you would be travelling with it and how often you wish to move it around the house too. Make the right choice for your little one and give him the perfect place to play, rest, nap and move around in! A good pack and play should be quite easy to use and carry from one place to another as that is what a pack and play is all about! Being easily portable makes a pack and play an ideal choice. You should be able to easily break down the product, fit it in a small bag and put in the car’s trunk or on a plane without any issues. Lightweight pack and plays are the first choice of any parents as the sole purpose of such a product is to be able to move it around the house and also outside it easily and quickly. The lighter the product, the easier to carry and move around with. Buy a product which has comfortable and sturdy handles or grips for the pack and play to be carried around. Ideal and popular pack and play’s are obviously very easy to break down but after being broken down, they also become compact in size and easily fit into a small bag which generally comes with the product itself. This makes it simple for the parents to carry the pack and play to a friend’s house or to another city. 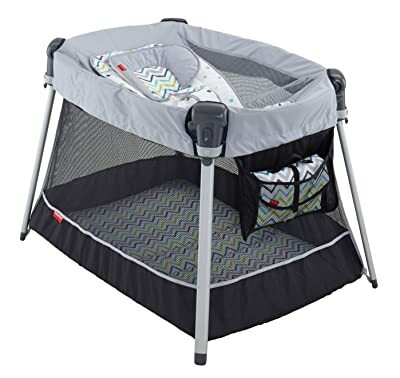 Just being easy to carry and lightweight is not enough, as one of the top things to consider is that the pack and play is extremely comfortable for the newborn and he does not feel any discomfort when lying on it. As the infant will be spending a lot of time in the pack and play during the initial months, it is essential that he feels relaxed in it and enjoys every moment thoroughly. The pack and play that you intend to buy must be made of superior-quality materials only which meet all the safety standards and should be safe by all means for the child to lie in. You must ensure that there are no inferior or harmful materials in it which can harm or affect the newborn’s gentle skin in any way. For new parents who are looking to create a safe and playful environment for their little ones and keep them safe at all times, any one of these playards would be an idle choice. You can choose a Pack ’n Play which best suits your unique needs and budget and also fits in to your home and room easily.